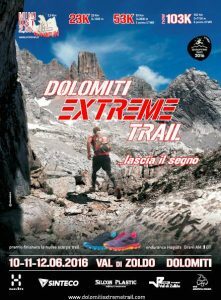 Just a little less than four weeks to the Dolomiti Extreme Trail, trail race in the heart of the Dolomites in Val di Zoldo. It will be on June 11, 2016, with three different amazing paths, that will test athletes from all around the world: the classic of 53 km, a shorter of 23 km, and the new path 2016, the 103 km one, with D+7150 and D-7060 m.
At Residence Valpiccola, about 6 km from the starting line of the 23 km path, the last apartments are still free! See you soon!